AP MDM Cooking Rates Enhanced: New Cooking Rates GO.No.260,Dated: 21-10-2016, MDM Scheme Cooking Cost New Rates From 01-07-2016 for AP Schools, Mid Day Meal Scheme Cooking Cost Revised Rates, National Program of Mid Day Meal Scheme for the year 2016-17, AP GO.260, providing egg thrice a week, Cooking Cost Enhanced/New Rates for PS, UPS and High Schools in AP State. School Education Department - Mid Day Meal Scheme - Enhancement of cooking cost of Primary and Upper Primary and High Schools under Mid Day Meal Scheme - Orders - Issued. In the reference 3rd cited, the Commissioner of School Education has stated that in Lr-F.No.1-2/2018/MDM/DESK,Dt:15.11.2018, the Director (MDM), DSE&L, MHRD, GoI has informed that the cooking cost under National Programme of Mid Day Meal Scheme in Schools (NP-MDMS) has been increased by 5.35% over and above the existing cooking cost w.e.f. 01.04.2018 for the year 2018-19. The cooking cost will be shared between the Centre and State in the ratio of 60:40 for primary and upper primary classes respectively. 2. In this connection, the Commissioner of School Education, A.P. has stated that the MDM is being provided with 100% State Government assistance for classes IX and X. The menu and cooking cost for IX and X classes is equal to that of Upper Primary classes. The existing rate of cooking cost for Upper Primary classes is enhanced from Rs.6.18 to Rs.6.51 by Government of India and, thus, the cooking cost for IX and X classes has to be enhanced as per Government of India norms. Accordingly, the rate of cooking cost for IX and X classes i.e. 100% State Share has also to be enhanced to Rs.6.51 (by 5.35% enhancement) with effect from 01.04.2018. The Commissioner of School Education, A.P. has, therefore, requested for necessary executive orders for enhancement of the cooking cost rate by 5.35% over and above the existing cooking cost for classes I to VIII, NCLP and also for IX and X classes with effect from 01.04.2018 under National Programme of Mid Day Meal in Schools (NP-MDMS) as per the Government of India norms and also to allocate necessary budgetary provision accordingly. 3. In the circumstances reported by the Commissioner of School Education, A.P. in the reference 3rd cited and after careful examination of the matter, Government hereby enhance the cooking cost per child per day by 5.35% over and above the existing rates for Primary, Upper Primary, NCLP and IX & X classes as stated at column No. 5 of the table below w.e.f. 01.04.2018. 4. The Commissioner of School Education, A.P. shall meet the expenditure for the said enhanced cooking cost within the B.E. 2018-19 and move re-appropriation proposal, if funds are not sufficient. 5. This order issues with the concurrence of Finance (FMU-School Edn) Dept vide their U.O.No.FMU0BES(SE)/6/2018, dated:18.12.2018. G.O.Rt.No. 260 Dated: 21/10/2016: Government of AP, School Education - Mid Day Meal Scheme - Enhancement of cooking cost of Primary and Upper Primary and High Schools for Implementation of Mid Day Meal Programme -Orders - Issued. 1. From the Director (MDM), GOI, MHRD, Department of School Education & Literacy, MDM Division, F.No.11-1/2011- Desk (MDM),Dated: 1/7/2016. 2. From Commissioner and Director of School Education, A.P., Hyderabad, Letter Rc.No.01/MDM-1/2014, dated 5/7/2016. In the reference 1st read above, Ministry of HRD, Department of school Education & Literacy, Government of India have increased the cooking cost for 2016-17 @ 7% over and above the cooking cost for the year 2014-15 for Primary and Upper Primary Schools. w.e.f 1/7/2016. 2. In the reference 2nd read above, the Commissioner and Director of School Education, A.P., Hyderabad has requested the Government to issue orders for enhancement of cooking cost under National Programme of Mid Day Meal Scheme w.e.f 1/7/2016 from Rs.4.86/- to Rs.5.13/- for Primary Schools and Rs.6.78/- to Rs. 7.18/- for Upper Primary Schools as per GOI norms. She has also requested to enhance the cooking cost for classes IX & X th from Rs.6.38/- to Rs. 7.18/- as 100% State share. 4. For classes IX & Xth, Government also here by enhance the Cooking cost from Rs.6.78 to Rs. 7.18 w.e.f 1/7/2016 as a (100%) State share for providing Mid Day Meals. 5. She is also requested to examine the modalities of centralized kitchens within the existing budget. 6. The Commissioner of School Education shall take further necessary action in the matter. 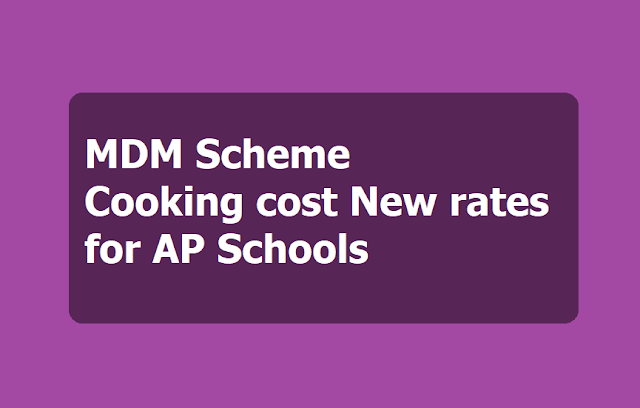 Govt of AP, School Education-Mid Day Meal Scheme-Enhancement of cooking cost of Primary and Upper Primary and High Schools for Implementation of Mid Day Meal Programme. Reference: 1.From the Director (MDM), GOI, MHRD, Department of School Education & Literacy, MDM Division, F.No.1-1/2009-Desk (MDM),Dated: 1/1/2016. ; 2. From Commissioner and Director of School Education, A.P., Hyderabad, Letter Rc.No.01/MDM 1/2014, dated 6/1/2016. ORDER: In the reference 1st read above, Ministry of HRD, Department of School Education & Literacy, Government of India have increased the cooking cost for 2015-16 @ 7.5% over and above the cooking cost for the year 2014-15 for Primary and Upper Primary Schools. w.e.f 1/7/2015. 2. In the reference 2nd read above, the Commissioner and Director of School Education, A.P., Hyderabad has requested the Government to issue orders for enhancement of cooking cost under National Programme of Mid Day Meal Scheme w.e.f 1/7/2015 from Rs.4.60/- to Rs.4.86/- for Primary Schools and Rs.6.38/- to Rs. 6.78/- for Upper Primary Schools as per GOI norms. She has also requested to enhance the cooking cost for classes IX & X th from Rs.6.38/- to Rs. 6.78/- as 100% State share. 4. For classes IX & Xth, Government also here by enhance the Cooking cost from Rs.6.38 to Rs. 6.78 w.e.f 1/7/2015 as a (100%) State share for providing Mid Day Meals. 5. The Commissioner of School Education shall take further necessary action in the matter. 6. This order issues with the concurrence of Finance Department vide their U.O.No.45698 /FMU.Education.SE /16, dt.23/2/2016.